Killer Instinct | Trick or Treat! You’ll all be happy to know there are no tricks hiding up our sleeves this weekend, only treats! It’s been a while since we’ve done a Double XP weekend so we’re bringing you one now. Whether you’re going out trick or treating, staying in and eating your bowl of candy, or hiding from the doorbell, know that you can always hop into KI for some sweet Double XP treats. Also, friendly reminder that if you own Season 3 Ultra Edition or the Supreme Edition of KI, you already have a lifetime Double XP Booster. Coupled with the Double XP weekend and you’ll be treated to 3x the XP per match. Oh and if you purchase a Booster? 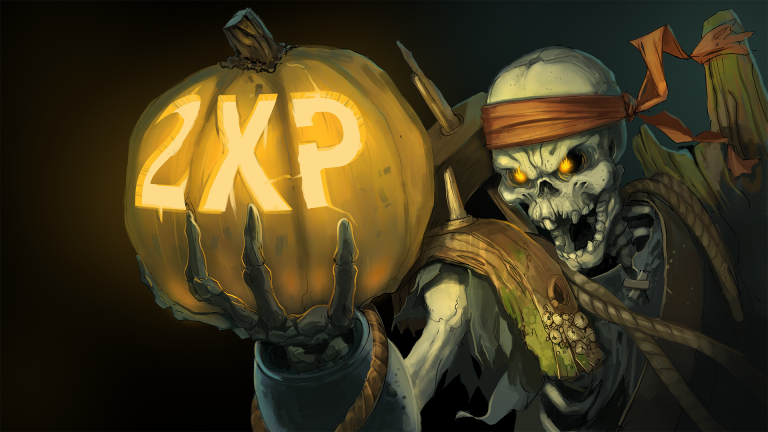 The treats become extra sweet with 4x the XP for the weekend. So, what are you waiting for? You’ve all got some KI to play and some XP to earn! Remember, this only lasts through Monday, October 30th so get cracking! If you can’t partake of the sweet treats we’re offering, don’t worry. Scuttlebutt says there’s more events on the way this year.